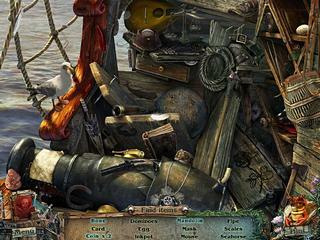 Secrets of the Seas - Flying Dutchman is a new release into the hidden object puzzle adventure genre. You are to join this story full of adventure and learn the secret behind it. All of this is happening through lots of tasks that you have to accomplish and nice audio-visuals. The whole game is not very challenging in all of the three modes. The story of Flying Dutchman is all about the ghosts and finding ways to escape them. But at least it's not like it's your grandpa or beloved, so it makes the story line more fun. The sea theme is also very apropriate for the adventures. The graphics is a massive tool for a story like that. And the developers have used it very well. The colors and music create the needed atmosphere. Another nice thing about the so to say clothing of the game is the funny characters and the humor throughout the dialogues. 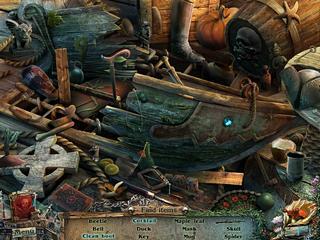 The hidden object levels are exactly what you would expect. You are given items to find on a list. Some of them require some interaction. The scenes are cluttered, but things are quite distinguishable. The SG opens up to where you are but does not follow your progrees. The hint system is a cute little lobster that refills quickly. It is fun to use it just for the fun of it. The whole game is not very challenging in all of the three modes. The game is a lot of fun and offers many great features. But maybe you still need to check the trial version first. This is Secrets of the Seas: Flying Dutchman review. Download this game here.